For two hours, residents voiced their opinions at a special meeting of the school board about a proposed shift in the current academic calendar to start school earlier beginning in 2019. At the meeting Tuesday, June 19, responses from a recent survey were announced, which showed that among district employees, parents, and students in eighth through 12thgrade 50% support the change, with 39% of respondents opposed and 11% undecided. Breakdowns showed staff and students favored the decision, 57.5% and 54%, respectively, while a majority of parents oppose the measure, 52% percent, compared to 43% who support it. Ultimately, no action was taken by the school board and another information session was planned for July 17 on the hard-to-resolve issue. The proposed change in scheduling conflicts with some late summer traditions, but it would align more closely with national student testing, local sports leagues and end the semester prior to the winter break. The controversial 2019/2020 calendarwas proposed after six months of data discovery and discussion by an 18-person committee of board members, teachers, administrators, and community leaders. Schedule adjustments, which include an earlier fall start date, were discussed at an earlier special session on April 12. Afterwards, Hanover Research was hired to create and distribute a survey on the issue. El Morro Elementary School teachers Mary Blanton, left, and Jamie Jameson expressed their reservations about changing the start date for students to return to the classroom. Photo by Amy Orr. 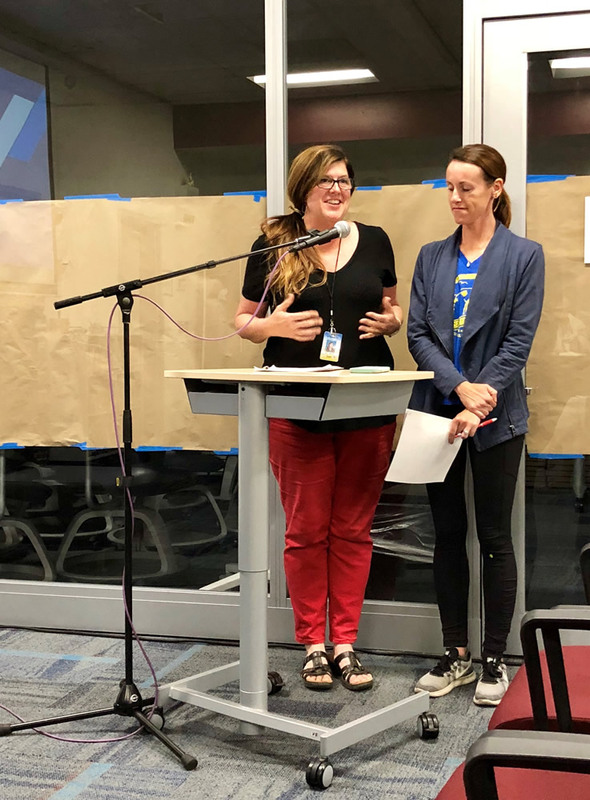 The teachers who spoke at Tuesday’s meeting embodied the complexity of the situation; high school teachers Dawn Hunnicutt and Kristin Cowles voiced approval for the changes, while El Morro Elementary teachers Mary Blanton and Jamie Jameson expressed reservations. Community speakers made passionate presentations. Many commented on the unique qualities of Laguna Beach, saying summer fun and family time would be disrupted if school started on Aug. 21. Danielle Roedersheimer, who has middle and elementary school children, said the end of summer is when Laguna returns to its local culture. “It’s a time to create memories with our kids,” Roedersheimer said. Some parents voiced concerns about the mental health of students and the importance of downtime in a performance-based society. Warner said she doesn’t really care about the calendar, but she does want students to have a semester break in December. “It’s terrible to have your kid be worried about school,” Warner said. Parent Amy Hundhausen said her desire for a stress-free winter break led her to back the calendar change. She thinks it is important to have the semester end in December so students can relax and spend time with their families. Anita Mangels, board member for Laguna’s Festival of Arts, expressed concern that an August start would impact the Festival’s relationship with student volunteers. Local children have traditionally joined the cast of the Pageant of the Masters, which runs from July 7 through Sept. 1. The Festival also provides scholarships to Laguna Beach High School students; this year, LBHS seniors received $27,000. At the meeting, Mangels said a calendar change could affect funding and the ability to offer scholarships. In a follow-up interview, Mangels backed away from that statement, saying that Pageant casts could be affected by an early start to the school year. “I can’t help but wonder if parents would allow kids to volunteer,” Mangels said. Superintendent Jason Viloria and school board members heard input from all sides before discussing the issue themselves. Several board members acknowledged student pressure and the need to relieve it. Viloria said that ending the semester before winter break and giving kids a homework-free holiday was a high priority. Although start dates might have to move up to achieve this goal, Viloria said he was open to exploring various scheduling options.